Adriatic Restoration Corporation, incorporated in 1982, offers professional exterior building restoration and waterproofing services to the New Jersey/New York Tri-State area. We specialize in exterior building restoration, repairs, waterproofing, and protection on brick, concrete, steel, stucco, and stone. Click here to learn more our restoration services in New Jersey / New York area. Call (201) 338-4642 today for a free consultation. All cracks, no matter the size, will allow water to penetrate the concrete. As the temperature drops, the water freezes, the ice expands, which creates larger cracks. 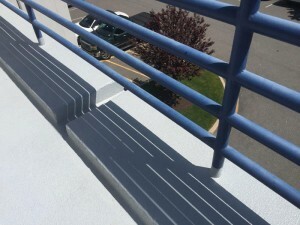 This water penetration can also affects the steel reinforcement frame of the balcony, causing it to rust and often leading to concrete spalling. Call (201) 338-4642 today for a free consultation. 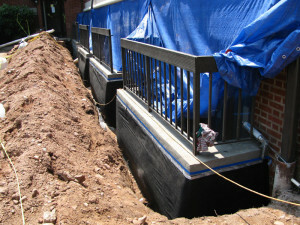 Or learn more about Balcony Waterproofing services in NJ and NY area from Adriatic Restoration. Below Grade wall waterproofing usually comes in handy with urethane injections or grouting when positive side waterproofing does not work due to surrounding circumstances. 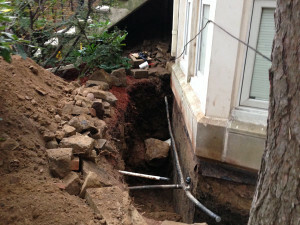 The foundation wall needs to be waterproofed on the interior side. Call (201) 338-4642 today for a free consultation. 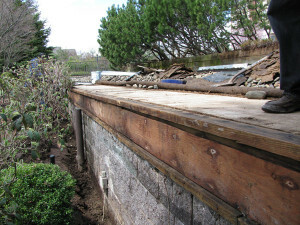 Or learn more about Below Grade Waterproofing services in NJ and NY area from Adriatic Restoration. 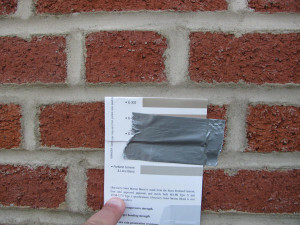 Brick tuck pointing is the process of repairing damaged mortar by tucking mortar into the damaged joint. The most important aspect of this repair is matching the repaired mortar joint with the surrounding mortar. Cracked and deteriorated mortar joints are aesthetically unpleasing and the most common way for water to enter a structure. Repointing deteriorated mortar joints is the most effective and permanent option to stop water from entering through brick and damaging the structure. Adriatic’s professional technicians are experts in brick repointing, brick repair and brick and mortar repair. We will perform an expert brick joint repair by carefully removing damaged and deteriorated mortar with vacuumed grinders, to ensure no damage is done to surrounding masonry and dust does not enter your building or pollute the environment. Call (201) 338-4642 today for a free consultation. Or learn more about Brick Repointing & Brick Tuck Repointing services in NJ and NY area from Adriatic Restoration. You may ask yourself, is waterproofing bring walls really necessary? Well the answer is YES! After years of weathering, the bricks absorb water. This causes them to deteriorate more quickly than other materials. Waterproofing brick walls will eliminate problems such as wet walls and the possibility of mold growing behind the brick. You do not need to feel overwhelmed, just call Adriatic Restoration Corp if you have any questions. We will be more than happy to accommodate you with your specific needs. Adriatic is a company that carries on the tradition of excellence with a truly select group of professionals. Call (201) 338-4642 today for a free consultation. 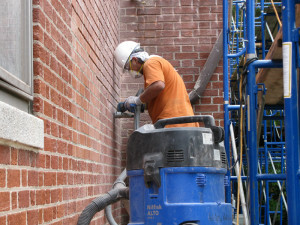 Or learn more about Waterproofing Brick Walls services in NJ and NY area from Adriatic Restoration. Call us at (201) 338-4642, or send a message.